Time to change the decor. Guess I'm not as Busy a Beaver as I thought I was. when I need something quick and substantial. I like my lap quilts large and in charge. 77" x 77" fits the bill. use the charm pack for the starting point. and will be a no brainer! 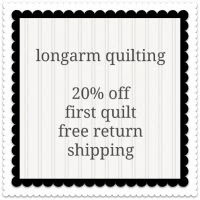 I've also included a baby size quilt pattern with this. This Miss Charm Pattern is in my store. 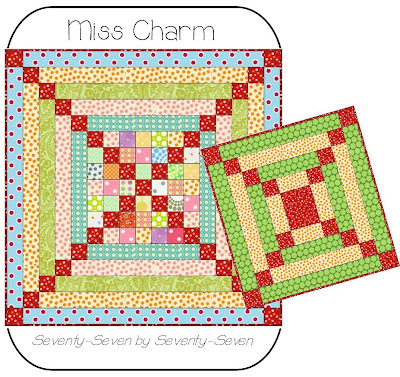 For today.....Buy Miss Charm and pick another pattern for free. Just let me know in the "notes to seller". Do not purchase the 2nd pattern, just tell me what you want. Des this really is so incredibly darling. I love it. Angela, It from an older line called Swell (the charm pack) and then because I procrastinated so much, i had to throw in the follow up line to Swell and the borders and such are Sweet. I think it's Urban Chic?? Urban Chicks. Someone bought a lot of Sweet, maybe you inspired them. Oh...maybe not, they bought it last night. I have one Sweet jelly roll left, do I stash, do I sell, stash, sell, stash, sell? I love it. Very cherry, fun quilt. I've made a Miss Charm. I sold it, because it was so fabulous. I need to make another. Good job, I'm glad you got you the pattern ready! You need to come and redecorate, decorate, celebrate spring for me! I love it! Love the colors, love the pattern, love that it's charm pack friendly. I always buy those things and never know what to do with them.